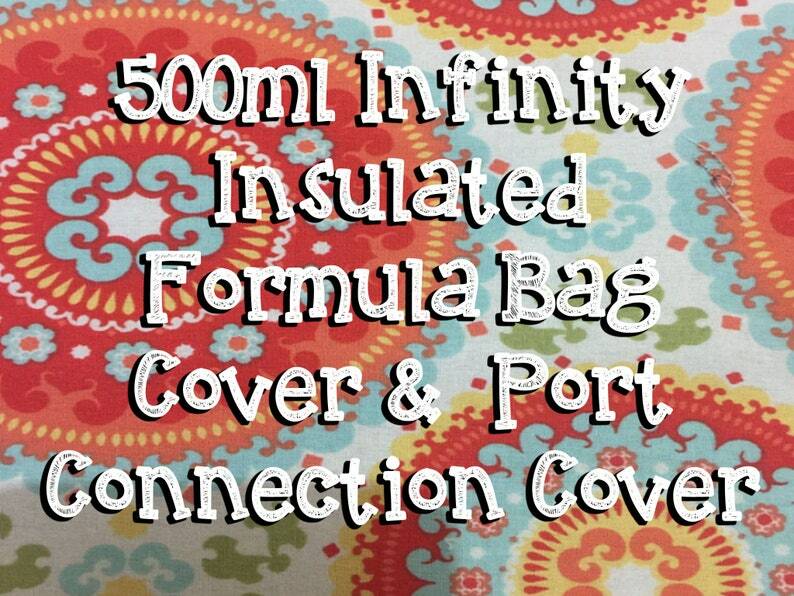 *This listing is for one 500 ml infinity insulated cover and one port connection cover. *This orange medallion feeding tube cover snaps around your 500ml Infinity feeding bag which provides an easy solution to keeping your bag chilled for long duration feedings. The port connection cover keeps you from finding your port connection was accidentally pulled apart during the night and you it ended up feeding the bed! Ugh. Or perhaps your little one has curious fingers and likes to play and disconnect the connection. Simply snap our flat Port Covers around the port connector and feel secure that the connection is now safe and secure. -Located along the inside of the bag are two mesh pockets to hold your ice packs snuggly against your bag to keep it nice and chilly all day or night long. -To use, place your own cold icepack(s) in the mesh pockets, fold the cover shut like a book around the prefilled bag, and snap the five KAM snaps along the edge and bottom of the cover. Please note this listing does NOT include the ice packs. The flat lunch box style ice packs work best in this design and can be found in the lunch box section of box stores or online.